In the spring of 2013, the 201 Greengineering class gathered together for one, massive brainstorming session. After a successful completion of the swing pump, we were determined to find a new, unique project to begin. From the minds of fellow Capstoners, Owen and Sean, and many others, brilliant ideas emerged. We thought about creating a giant loft inside the incubator room. This included a hangout spot on top of the ceiling. 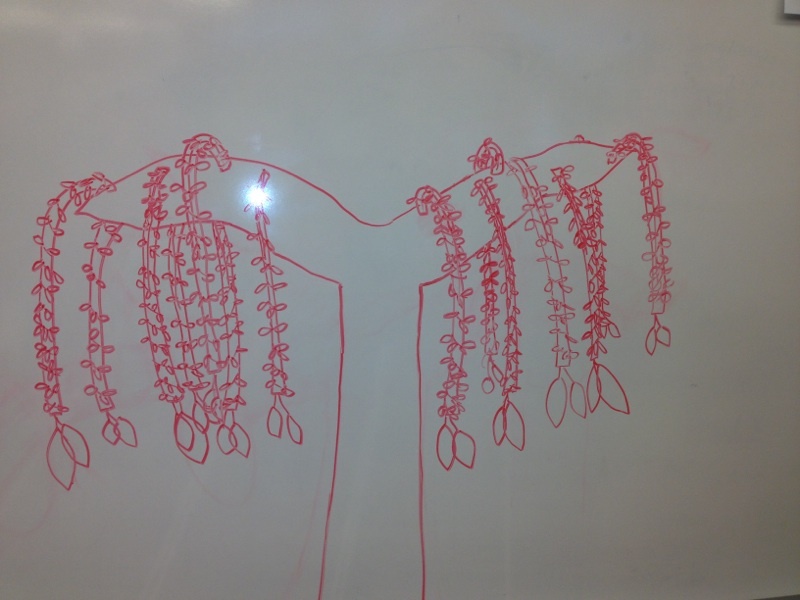 We wanted to design our own version of the El Arbol tree. Plans to recreate the courtyard space with a greenhouse lounge. As we moved into the 2014 year, many of the 201ers became 301ers. The ideas of our past brainstorm had lingered over us. The Green Campus Initivite formed as we partner with BAC. 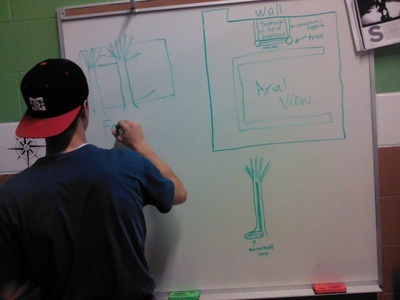 Owen, plans to work on the innovative tree house for his SYP (http://innovativetreehouse.weebly.com/). 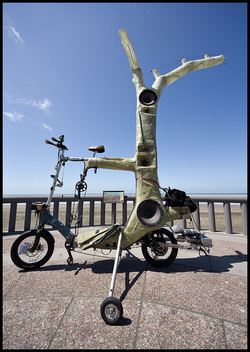 I plan on creating my own version of Paul Friedman, of Rock the Bike, El Arbol tree, now known as the El Newton Tree. 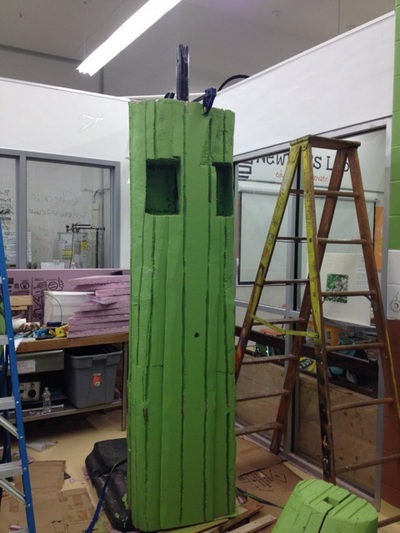 Over the course of this blog, you will follow our progress as we design, engineer, and build a full scale music tree. When we begin brainstorming the design of the Music Tree, we hoped to mimic, not replicate, the innovations of Paul Friedman's El Arbol tree. One initial point of difference was our main structural support. 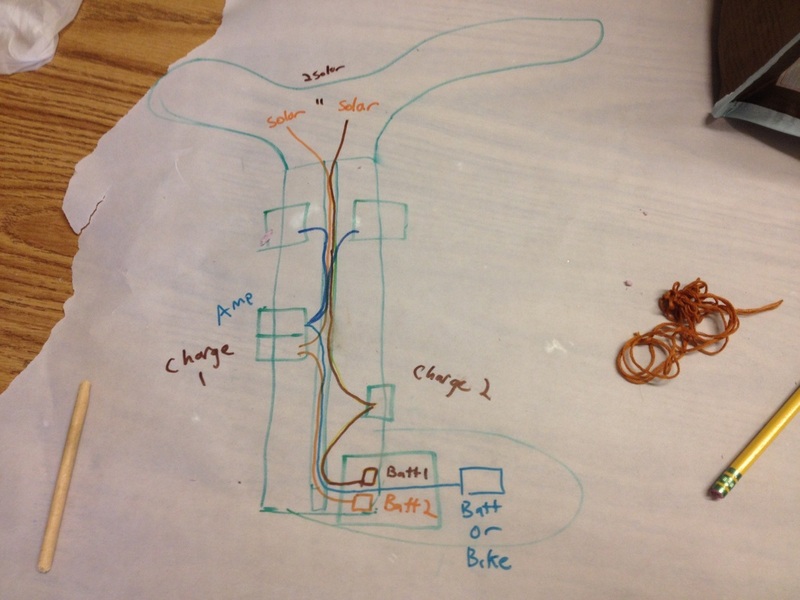 Paul designed his tree around a bike. 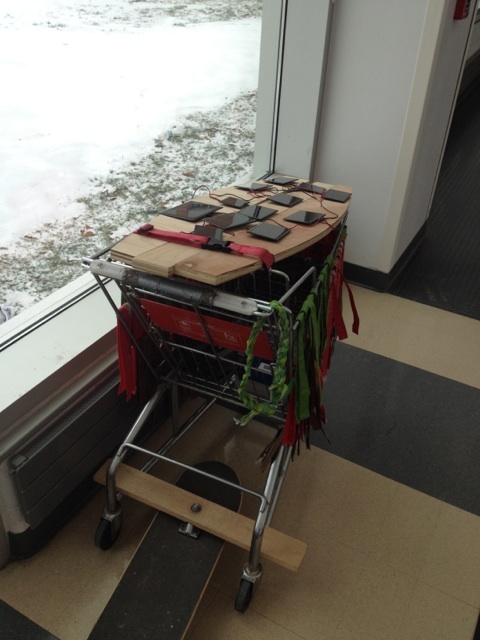 In order to keep the tree relatively simple to engineer and mobile, we utilized a team member's old basketball. With wheels on the bottom, we realized the ideal nature of the hoop. 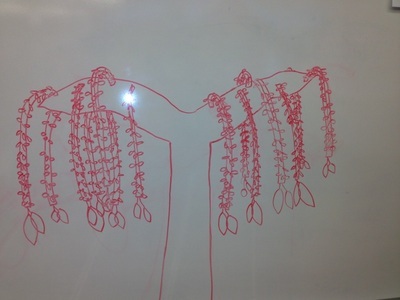 Here is a picture of Paul's El arbol tree. From here we began to sketch and imagine the possibilities of what the tree could be. 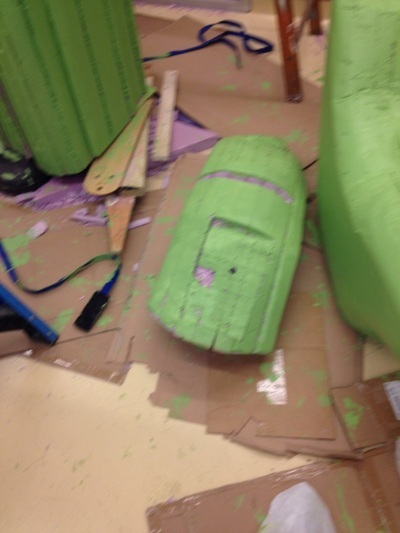 Within the Greengineering Lab, if you have an idea, you make a prototype. What many novice designers and engineers fail to understand is the disconnect between the mind and tangible world. While an powerful idea may sound plausible it may have apparent failures as soon as it becomes physical. 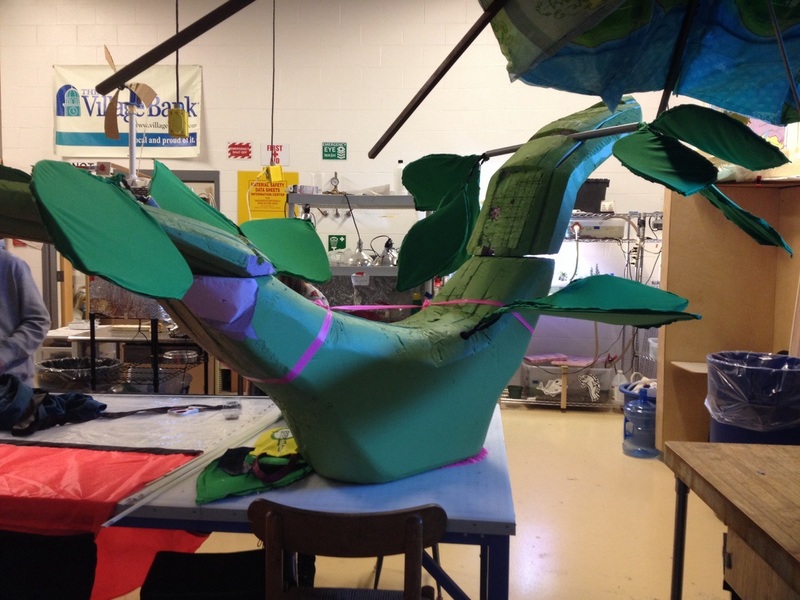 When we were discussing the tree design, our first instinct was to make a small scale, rapid fire prototype. 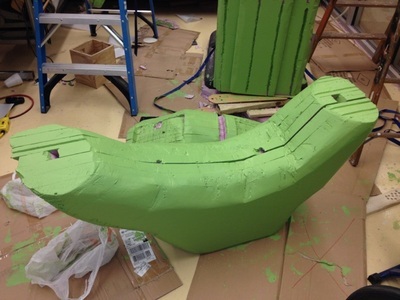 After trimming a few piece's of foam down to scaled replica we had our first prototype. After a quick trip to Home Depot, we were ready to assembly the start of the base. In the middle two pieces we cut out a semi circle in the foam so that they could wrap around the hoop. On the front of the tree, the foam could slide on easily. However, on the other side, there were to structural supports from the basketball hoop that interrupted an easy connection. Right away, we had ran into a design challenge. Initially we had a few solutions. One idea consisted of rotating the way we placed foam on the hoop. Instead of front/ back, we could use a side to side. However, we thought it would be simpler to only cut one piece. Therefore, we realized that we could cut off the bottom quarter of the back piece and implement it underneath the supports. This solution gave the appearance of a fluid piece quite effectively as well. After attaching the foam to the hoop, we had to determine the shape of the tree. 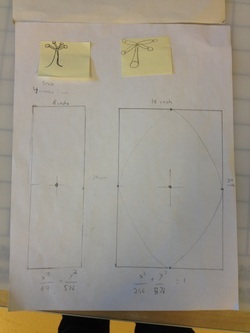 From the rectangle, I calculated the largest ellipse that we could achieve. While I used the old formula I felt nostalgic to my sophomore geometry class. 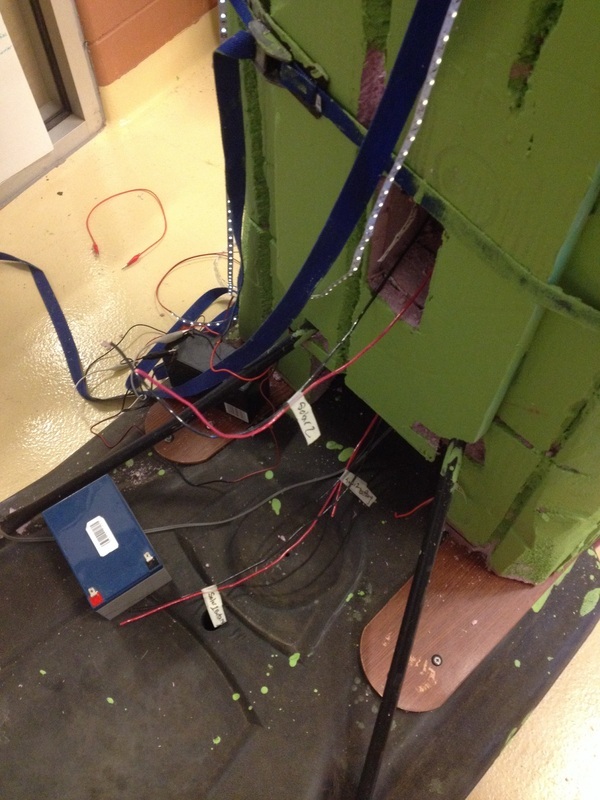 Once the shape was finalized, we began to trim the access foam and derive our tree. The next aspect of music tree that we began to work on was the Canopy. We knew before hand that the canopy would be our biggest challenge yet. 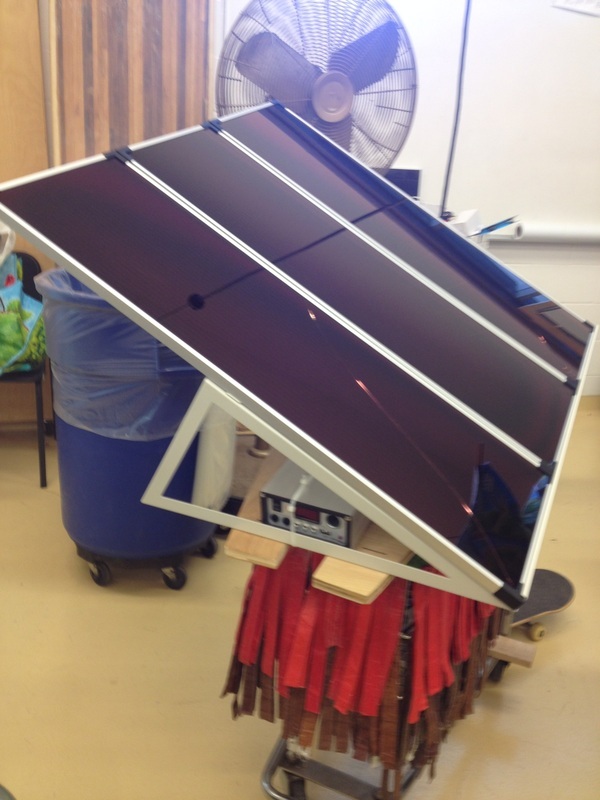 We had to include a solar panel system while minimizing the foam usage. 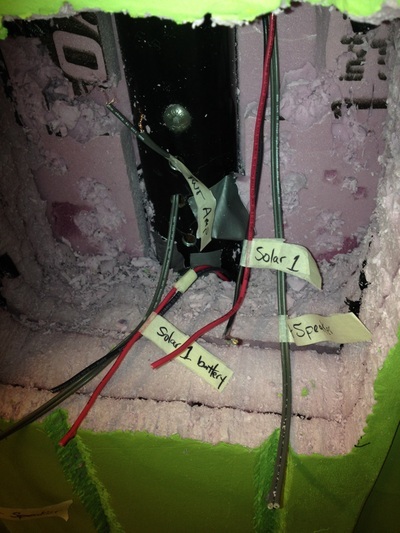 From here, we split up into two teams, structural and electrical. Structural Although it may seem simple, designing a canopy for a mock tree is not easy. Many details of branches are often ignored such as size and shape relative to the trunk. We had to do a little research in order to determine the ratio of height to width. Furthermore, we wanted to minimized the amount of foam we used and make sure that the top was removable. Our findings led to the initial design that you can see below. 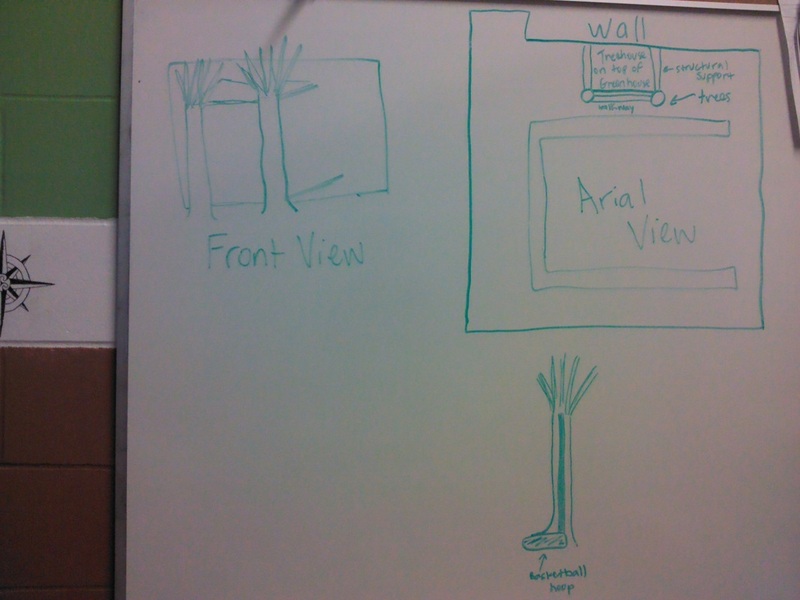 Here you can see a general concept of what we plan the overall tree to look like. The small solar panels represent the larger panels that will rest on top of the tree. 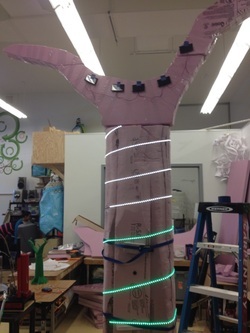 Also, we are planning on making the LEDS sit vertically and there will be more colors. 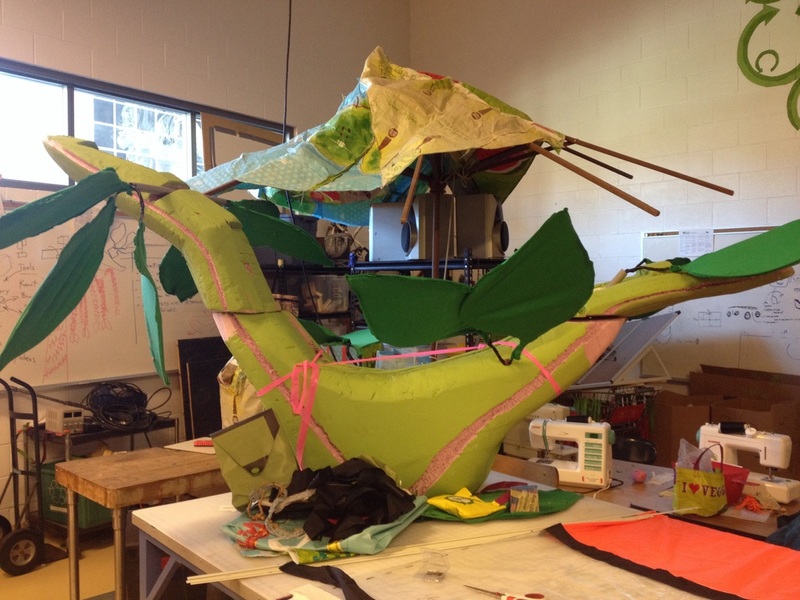 Leaf/ Canopy Concept: As we assembled the canopy, we realized that the tree was missing some "tree aspect". Jokingly dubbed the bunny ears, or branches did not give off the correct affect. 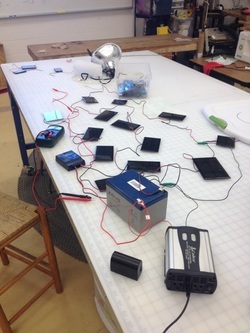 Luckily, our design team was ready to take on the challenge and began prototyping some leaf designs. We took some old copper wire and bent it to create a large, leaf like shape. Then, we wrapped a green fabric around them to give the effect of a leaf. The leaves were attached to a small pvp pipe that sits in a channel on the top of the canopy. Here you can see the back of the tree where all of the electrical componets are hidden from sight.